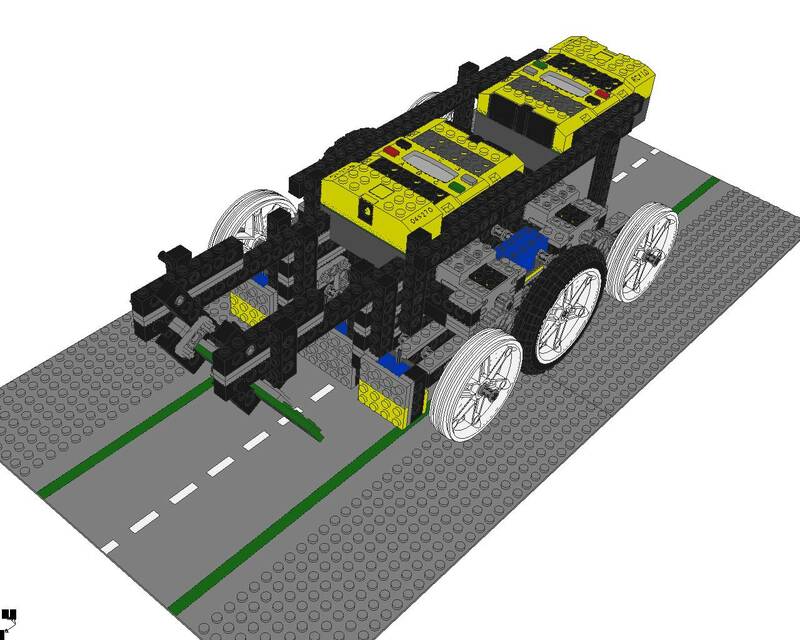 LEGO® based robot using a Raspberry Pi for computer vision. It's purpose is mainly to participate in DTU Robocup. My robots are ongoing projects. They don't ever really reach a state where I can say, that they are truly finished. They tend to sit on the shelf for a very long time sometimes and some robots are abandoned in the middle of development usually because I learn something new that the robot's development is contradicting. Figure 1. The first robot I ever built for DTU Robocup reconstructed — with slight modifications — using LeoCAD. My fascination for robots was sparked in 1997 when I witnessed a robot competition called Robocup at DTU. I was fresh in college and my programming skills were still in the early making, so I had no clue as to how the guys in the competition could make their robot vehicles do all the things they did — but it was great fun to watch. 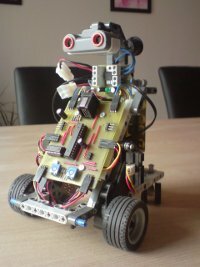 I built my first robot together with two team mates in 2005. We had enrolled in a university course called "Participating in DTU Robocup 2005". The course was an introduction to techniques used when building autonomous robots and the goal was to participate in DTU Robocup. 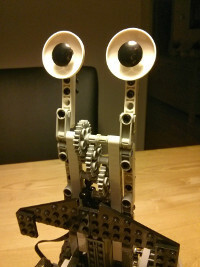 The robot was made using only LEGOs from the MINDSTORMS kit and was programmed in Java using leJOS (a tiny Java VM for the LEGO RCX micro-controller). It ended up completing the easy part of the Robocup course which was far more than we had expected. Being inspired by the other Robocup contestants' custom built electronics, I started out learning about electronics and how to build line sensors, motor control and other robot related stuff. I participated in Robocup two times with some crappy robots that didn't go very far. One was a small LEGO car with a breadboard on top and two 9V batteries connected in series with no micro-controller and the other was a radio controlled monster truck with a 4-channel line sensor controlled by a PICAXE micro-controller. After those epic failures, I concluded that I had to get a lot better at making robots before entering Robocup again. That was then, this is now, and now I think I've gotten so much better at building robots and electronics, that I should be able to build a robot that can win the competition or at least make it to the top 3 — provided that everything goes as planned which it rarely does :-). Anyway, I'm in it to win it! When I started out learning about electronics and building my own circuits, I didn't know where to find good information to get started with. After trying out some math heavy text books, I found Robot Building for Beginners (Technology in Action) and this was a major turning point for me, since it's a really well written book that explains how to build a simple line-following robot with simple electronics. The author shows how to machine custom parts for the robot and explains the major aspects of bringing a robot to life. The book was a quick read and after reading it, I was ready to do some experimenting. I also bought Intermediate Robot Building (Technology in Action) which picked up where Robot Building for Beginners left off. This book went on to explain the details of building motor driver circuits, infrared detector circuits and how to use micro-controllers (although the micro-controller was not exactly the type I used, it was inspiring to see another one that I had never heard of before). The two books are well worth the money they cost, since they will take you so much further in your understanding of robot building and they are written in common english with no heavy math. The author of those two books, David Cook, has a nice robot/electronics homepage at http://www.robotroom.com. Copyright © 2019 Defiant Development. All rights reserved.